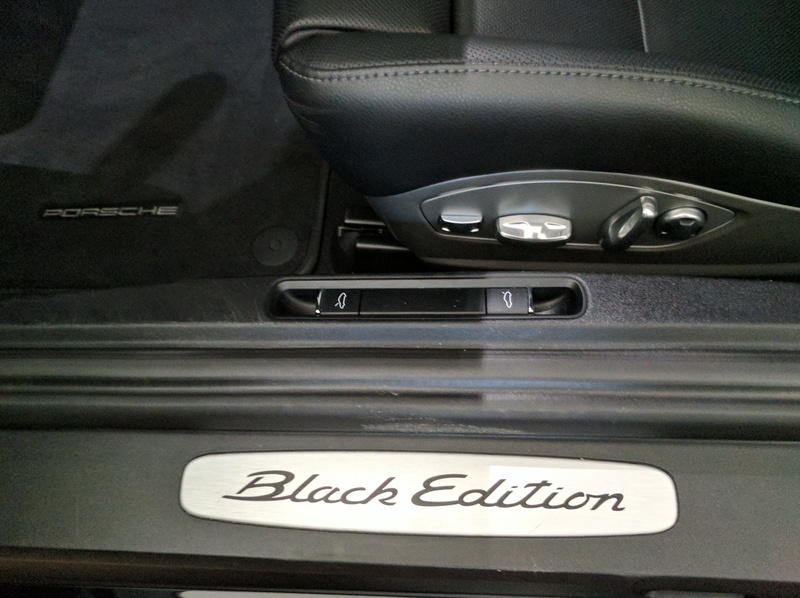 A sudden switch to a 2016 Porsche Boxster Black Edition implies there must have been something wrong with my previous ride. 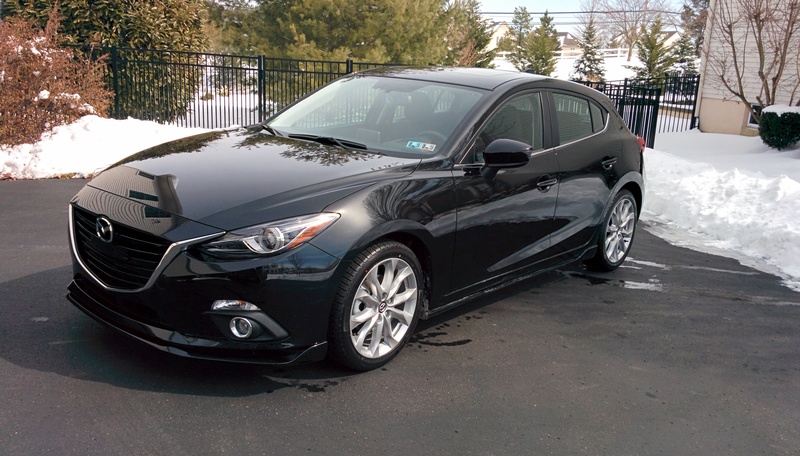 If you read my previous post on my Mazda3, you’ll learn that I always considered this car a compromise. I couldn’t find a car that I really liked – the new Golf R stick wasn’t out yet. The new A3 hatch didn’t have a stick. BMW…yeah…they were in-between the 1-series and the new 2-series was not out yet. With the Mazda3 I could get into a car with a stick at a great price, with decent equipment, and for what it is a really nice ride. The Mazda3 had some really good things going for it: nice manual shifting, decent sporty driving, great gas mileage. It also had some things I really didn’t like. A very small (10 gal.) fuel tank meant stopping constantly. Even at 32MPG that means an effective range of only around 290 miles. Ridiculous. Minor quips about how the locking system worked, the light grey headliner, the instability of the navigation system (crashing and reboots while driving), the cheap appearance package of glue on spoilers that do not stay glued on also pushed me towards looking for something new. Bottom line – with about 35,000 miles on the Maxda3 and a commute that will get going from 32 miles to about 40, I was ready to move on and looking for something new. Although my decision to get a 2016 Porsche Boxster Black Edition was sudden, I certainly had been looking for quite some time. I drive a lot – about 18-19K miles per year. I figure I spend 700-800 hours a year driving a car. Driving is how I start and end my work day. Why not take the opportunity to start and end the day with positive energy? So I’ll blame my friends at the J&J Human Performance Institute for this one! With the kernel of change firmly planted in my brain, I began to have a very specific set of requirements based on all of my previous cars. Most important – the car selected will be my daily driver. Looking at 80 miles/day and 2.5 hours of driving. If you are a regular here at Tarn Aeluin, you’ll know that I own a Porsche 911 Targa. Open-top…yeah that’s a definite requirement for a new car. 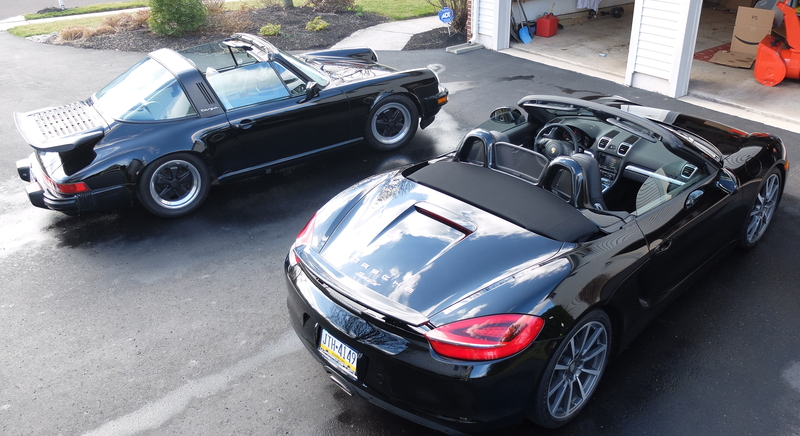 Hardtop or soft top, but a daily driver convertible is a must. For the first time ever, I will consider an automatic. This is a tough one, but the reality is clear that many brands simply are no longer making manuals. A manual is preferred, but not required. 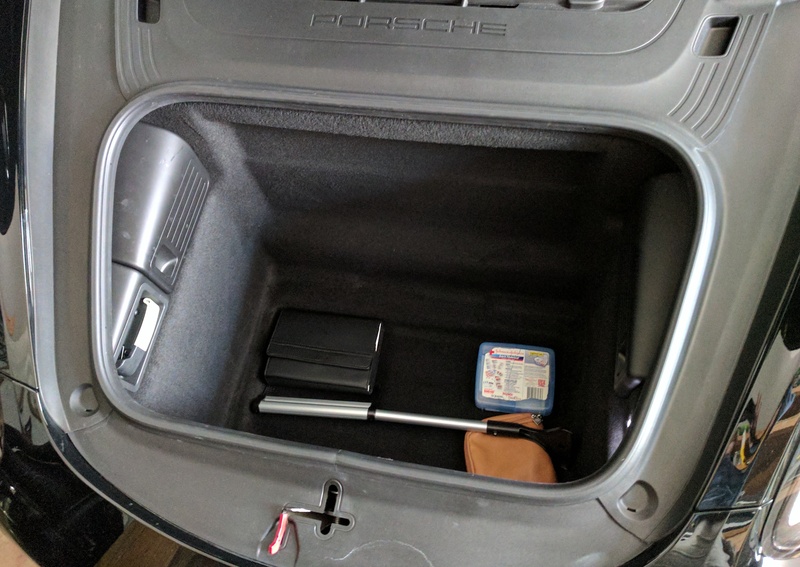 Great tech – I’m a geeky computer guy so the car needs the full compliment of techie stuff. Performance – not 0-60 straight line speed. I mean performance driving, feel of the road, sound, experience. Range – this is a new one, but I want a car that can go at least 400 miles without having to stop and get fuel. No silver trim work, especially outside. It always starts to look cheesy. Inside I can deal with it, but hope that I can minimize it. Those are the big ones. Range is a new one. 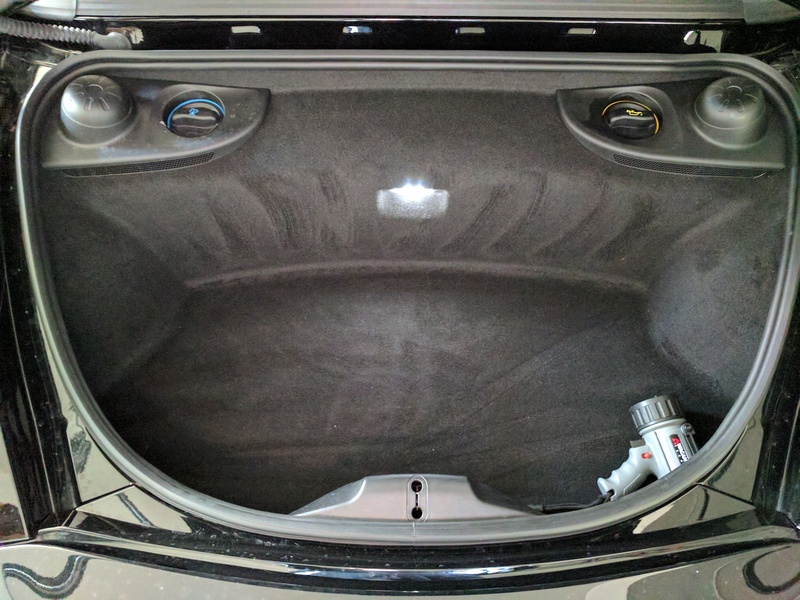 That 10 gallon tank in the Mazda3 just sucked. A standard 15 gallon tank would have meant a range of 430-450 miles, but with just 10 I was stopping for gas twice a week. Given the requirements above there’s a relatively short list of possible cars: Mazda MX5, Audi TT, Audi A3 Cabrio, Audi A5/S5 Cabrio, BMW 2/3 Cabrio, and a Porsche Boxster(718)/911. Although the Mazda is really nice (and the Fiat variant even nicer looking) I ruled it out right away because it felt like I would be sitting in the same car again. The interior is virtually identical to the Mazda3. The remaining cars – cha ching. I played around with all the options and configurations. Visited some dealerships starting last summer. A new car in this class is going to cost between $70K and er well…$300K for a 911 GT3. Crazy expensive. Based on that I decided that a used car is possible – low miles and CPO and a decent warranty would have to be included. I knocked out the BMW’s and the Audi A3 just based on looks. Very boxy looking outside and the interiors – eh. The Audi A5/S5 for 2017 was a definite contender. Redesigned for 2017 – these cars have great tech, great looks, and the S5 definitely has that performance feel. No manual option for this car. The 2017 is a new design, which makes going with a used model difficult, however in the end I knocked out the A5/S5. Beautiful car for sure, but its just too big. I have someone else in my car with me probably less than 10 times a year and maybe 1-2 times with more than 1 person a year. Dragging all that extra car around makes no sense. That leaves me with the Audi TT and a Porsche Boxster(718) / 911…and fate. 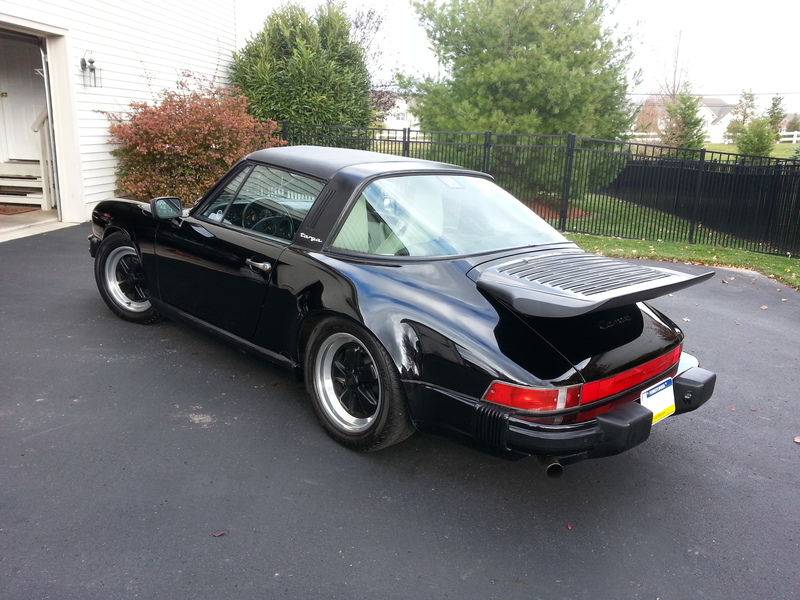 There’s no way I can justify a new 911 and even a CPO is pretty expensive. I did see a few manuals with mileage in the 30-40K range, but the more I looked at them the more I was ruling against a 911. The TT really was drawing my eye. Redesigned in 2016, the TT has great tech, the kind of performance that I am interested in, and looks great in black on black. I had registered my interest with a couple of dealers. 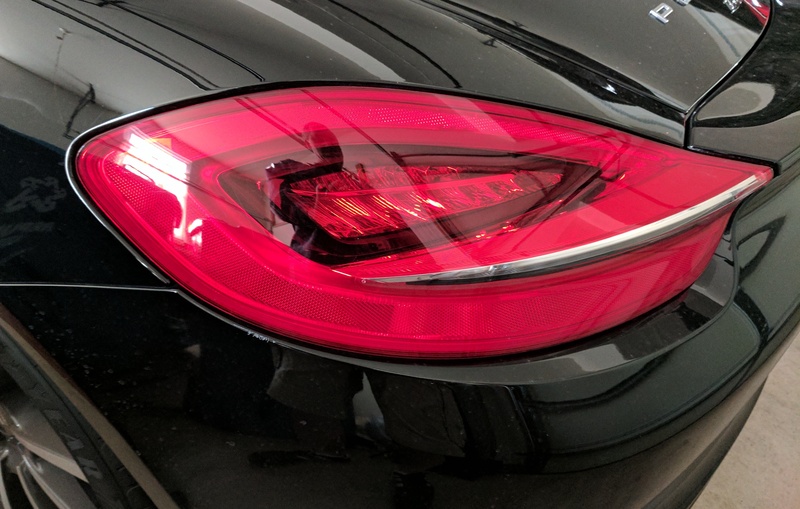 Last summer I checked out a 2016 Porsche Cayman Black Edition. Beautiful car, but no sunroof much less not a convertible. The Audi TT looks great on paper, but that’s all you can do right now in the area. I checked with several Audi dealers and no TT’s are around for a test drive. I have to admit the TT also has one feature that I hate: silver trim surrounding the windshield.. Ugh. 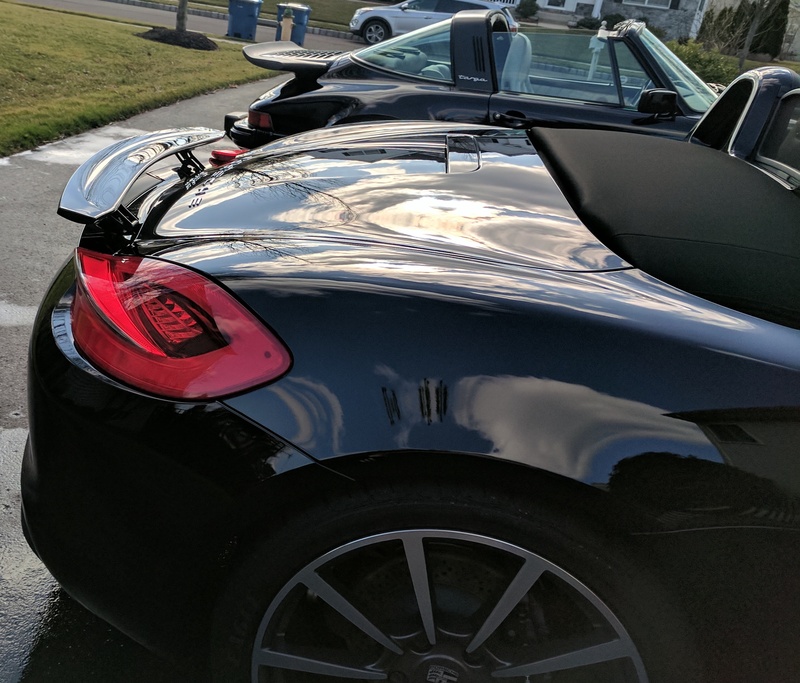 My local Porsche-Audi dealer emailed me a couple of weeks ago and said he thought he had a car for me – “a boxster gear jammer” arrived the night before. I cleaned out the Mazda, luckily I had just washed it, checked the finances and headed over to the dealer with the wife. 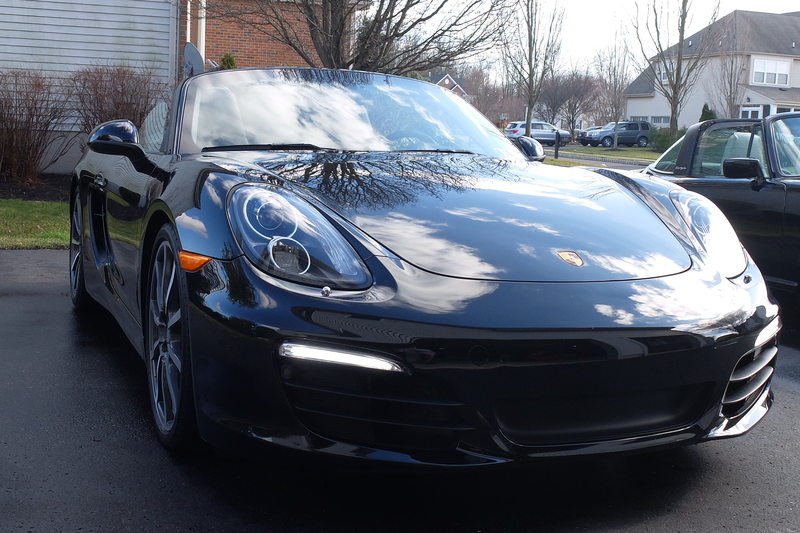 We test drove a few cars including a 2015 Boxster base model. That car was ok, but it was pretty bare bones. It was pretty much like driving my ’88 911 actually. 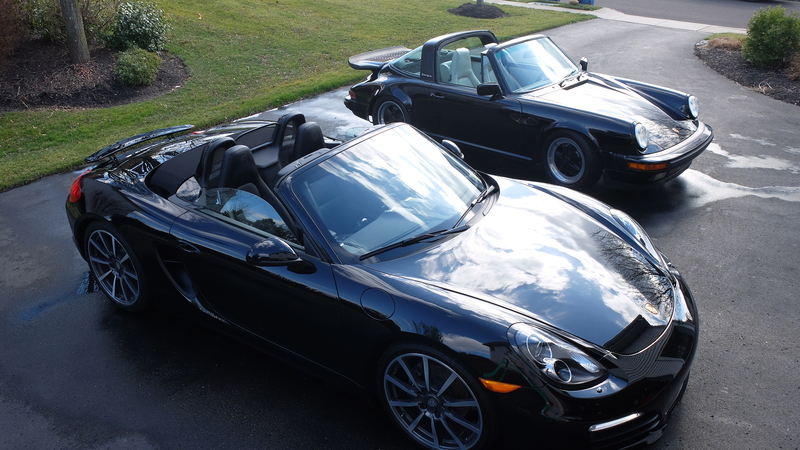 Then we drove the 2016 Boxster Black Edition. I was sold on this car within 45 seconds. Blacked out (pretty much), huge 20 inch Carrera wheels, cross-drilled brake rotors, 14 way sport seats with Porsche Crests, blacked out lights all around the car, sports suspension, and lots of tech with the full Porsche PCM, navigation package, BOSE surround sound, and PDLS Plus bi-xeon lights. 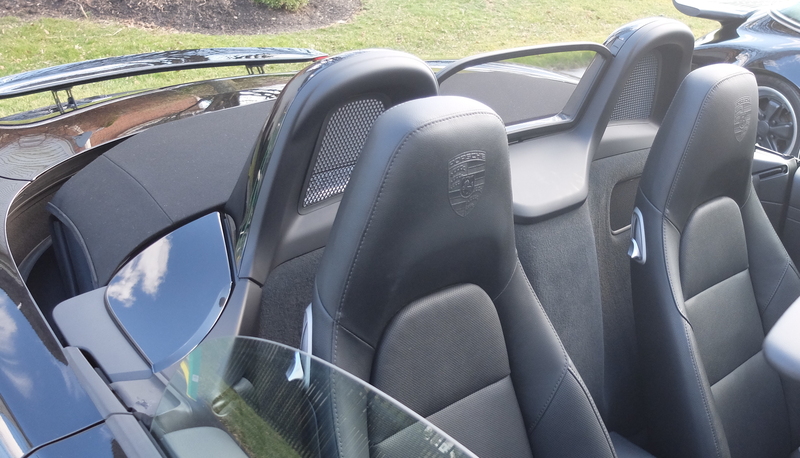 Fully ventilated seats (heating and cooling) along with a heated steering wheel will maximize “top down” days. 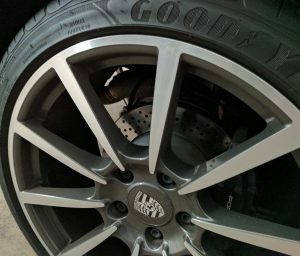 The car has only 8100 miles on it too so it qualifies for CPO (4 years under warranty) and for pre-paid maintenance plans. 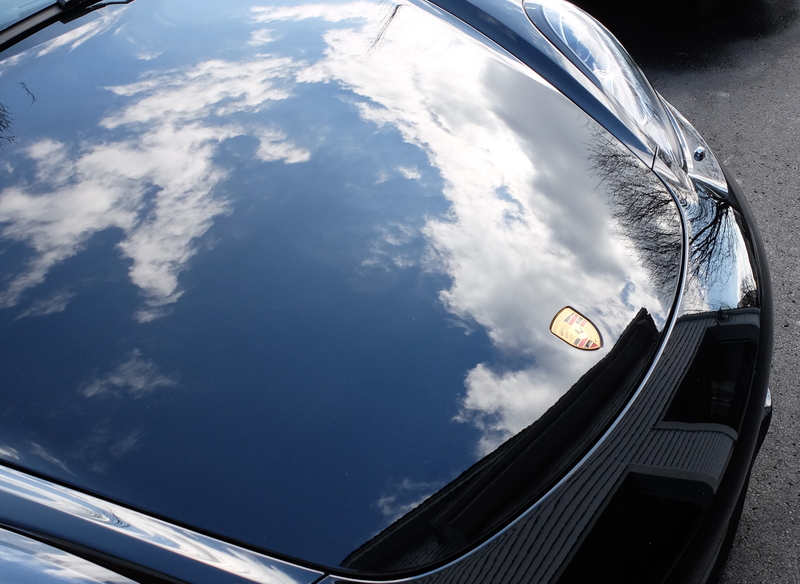 2016 was the last year of the Boxsters, the 4th generation is also known as the “981”. The cars are now known as the Porsche 718. 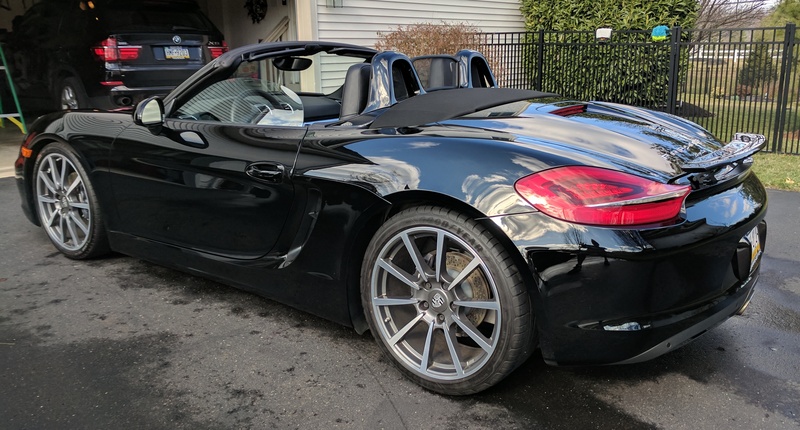 2016 was the last year for the flat six engine in a Boxster/718. 2017 models come with a 4 cylinder turbo-charged engine. Black Edition: hard to resist all the special gear included in the car. I’m going to drive this car a lot, but if I do want to sell it I think these three factors will help with value retention. Decision made…back to the dealer for the haggle-fest. So I’ve had the car for about 2 weeks. I’ve even been able to drive with the top down due to the warm winter we’re having. Driving the car is fantastic with the top up and with it down it is amazing. Driving is very tight, some might consider it jarring, but I like it. The car feels like it just wants to go go go!. Shifting is magical – very tight and smooth. The clutch is also very smooth. You need to figure out where the engagement zone is, like my 911, but then it simply takes some practice. The car is powerful and has a decent, but not crazy, exhaust note. 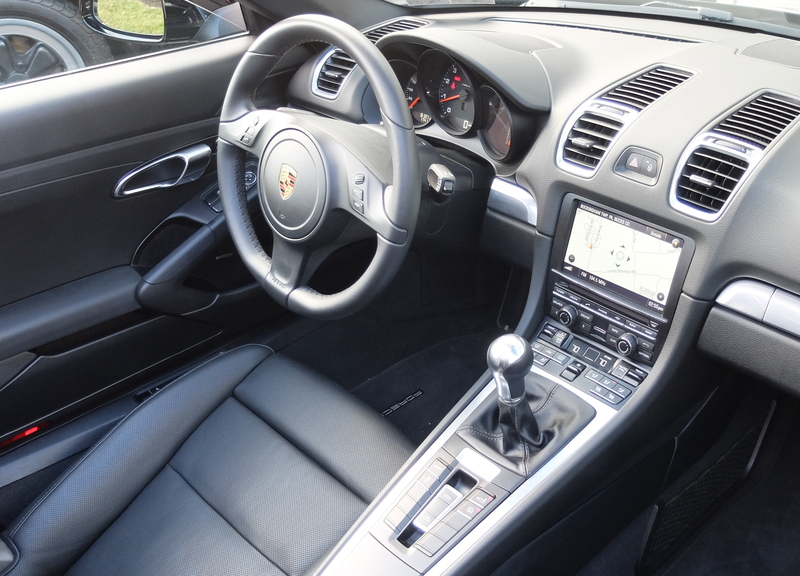 Steering is snappy, but I would want more weight to the wheel – more like my 911. When cornering there is very little body roll, the car is very composed, and you feel like you are in control even at decent speeds. The Sport mode noticeably kicks all of these up a notch. The top is fully automatic and opens and closes quickly. When open there is of course breeze, but its not too crazy. I have not tried a call at highway speeds yet. With the top closed calls are just fine even at highway speeds. Top closed driving is quite nice, not too much road noise. The most noticeable thing is creaking with the top when the body flexes – not a big deal at all. Trunk space fore and aft is great for a two-seater car like this. There is no back seat so anything you are carrying will need to go in there or go on the passenger seat. 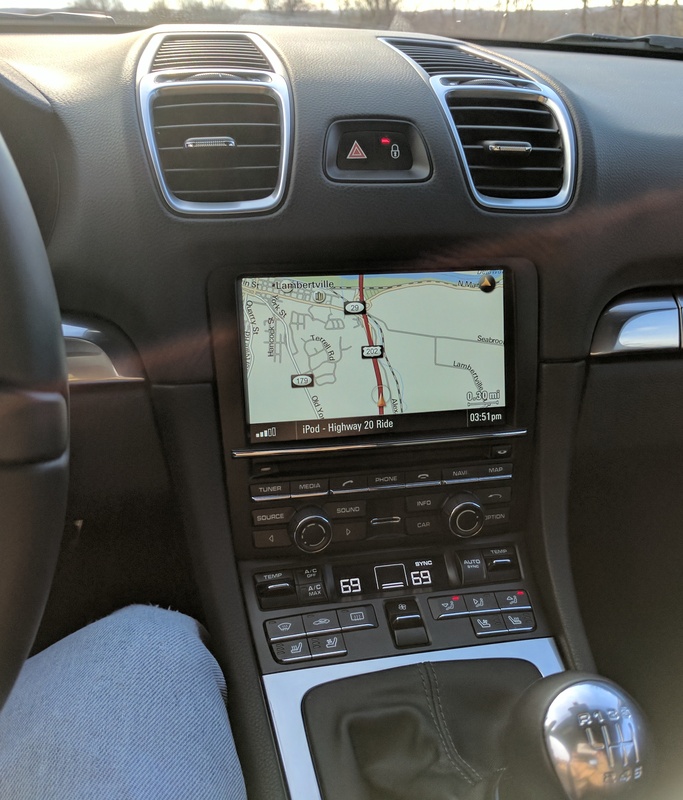 There are quite a few small buttons on the dash to figure out, but a quick read thru the manual and I had Bluetooth working, the Homelink garage opener working, and in general found everything pretty straightforward. Technology in the car is working great. My favorite feature is the right hand gauge dial that has a multi-function display. You can switch from trip data, to current operating data, to phone info, and a mini-nav map. 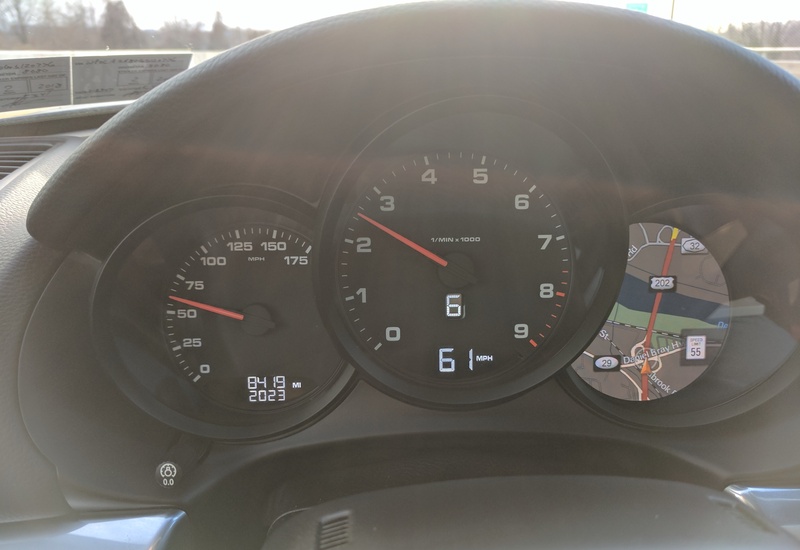 Classic Porsche big tachometer in the center is very responsive – pretty close to real time.